The project is a contemporary evolution of the classic courtyard tipology, unfolding the four sides of the courtyard along the axis of the main road, creating a central urban square facing south for both students and citizens. The creation of two different external levels that takes shape from the terrain, has enabled the customization of two different open spaces. the Lower square at 0.00 represents "The Hug", the most dynamic front, south faced, the New Centrality of the Alvar Aalto Campus. in this space of social interaction all the public university activities and the commercial/gastronomic front are concentrated. The north side of "The Hug", which is less enlightened, becomes the Media Lume of the campus with the presence of two theatres and one exterior stage. the Upper square at +5.00 is the quieter front of the project thought as a green open space with big terraces. the goal is to keep low in front the Alvar Aalto's building. The program is developed in a linear way on the site. Placing on the south-east the commercial front and on the north-west the university activities. Following the logics of the planning, the program turns into a curve that ends on the Vtt Building and generates the large central space, "The Hug". This approach creates an interactive environment for pedestrian and bicycle traffic, releasing and lengthening the visual outlook. The basement of the building is a vibrant glazed space, conceived like a green house, whereon the east side is concentrated a large retail front, such as grocery shop, copy shop, material shop, book shop, galleries and restaurants, and on the west side all the common activities of the university campus, such as exhibition spaces, lounge point, interactive and audiovisual areas, administrations, stages (Media Lume). This mix will guarantee a continuous daily life of this place, making it an attractive center either for its users or for those of the nearby universities. in fact the project's purpose is to provide a clever urban link between all the activities already existing and those that will be realized. On this common basement three boxes are settled. the lower one, that is in visual relation with the Alvar Aalto building, hosts all dining activities with their beautiful terraces on both sides. The development of the internal program is based on the principle of the mixing and sharing of activities, believing that this system could be a fruitful way to break down the usual concept of a university campus. 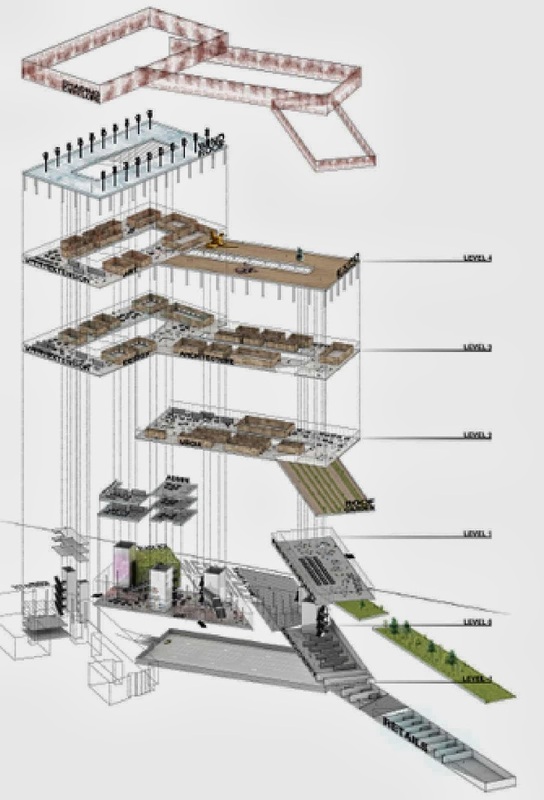 the Vtt expansion has been considered as an integrant part of the project being one of the sides that embraces this new centrality, in fact the highest box relies on the corner building, connecting it to the whole system and bringing into it new cultural energy. The Shading envelope provides a climate control depending on the exposition, concentrating glazed surfaces on the south-west to accumulate heat during daylight hours and more opaque surfaces on the north side to eliminate the heat loss. the roofs play a key role in the project as generators of life, interactions and energy. The lowest roof is totally merged with the ground, being a beautiful terrace and a set back with the Aalto building. the second and the third roof are two powerful terraces serving the university spaces where in summer period students can enjoy the beautiful views on the bay. Those two roof decks could be imagined also as exhibition spaces for the artistic production of the campus. The Highest roof is equipped with wind turbines that guarantee the production of the energy for the new building and the surroundings. All the design choices are directed in the way of durable development through the use of high performance materials, capable of limiting consumption, natural ventilation, natural management of humidity inside, rainwater recovery and the use of renewable energy such as geothermal energy.